Content marketing has been the talk of the town with every dental marketing firm for the last few years. While many understand the general theory, few can claim to be true experts. One of the places people consistently struggle is with writing great blog post headline & email subject lines. How you write these important pieces of content will usually be the difference between success and mediocrity. This blog post will be going over 3 warning signs your headlines could use some work. We will also give recommendations on what you can do to improve this part of your game. Email marketing can be an extremely powerful tactic for finding new leads and nurturing them into paying clients. Before either of those things can happen, you need to get the user to click into the message. If you see that the open rate on your email blast is below 20% there’s a good chance your subject line stink. Subject lines are one of the most important parts of an email marketing campaign. There’s really no magic bullet to solving this problem. How you construct a good subject line will depend on the target demographic and industry. However, there are several best practices to follow that should help you improve user engagement. Offer Value – People love to get things for free and feeling like they are getting a great deal. Be sure to think about what you can offer that separates your campaign from the pack. We recommend adding a value preposition to the actual subject line. It could be something like “20% Off This Weekend” or “Online Blowout Sale”. Anything that peaks the user’s interest. Urgency – Creating urgency is something all salesman try to do. It doesn’t matter if you are selling a car or IT software, if you are able to create urgency, your engagement rate will go up. We recommend working this into your subject lines. You could try something like “Weekend Sale 35% Off All Merchandise”. If you get your audience to think they can only take advantage of what you’re offering for a limited amount of time, it will improve the number of opens. Curiosity – Getting a user curious about your message is a great way to improve open rates. This can be done by giving them a little bit of a teaser. It can also be done by asking a question. You could try something like “Struggling with Weight Loss”. This gets the user thinking you might have an answer to his/her problem. When you can create curiosity, people will start engaging with your message. Putting search engines ahead of users is always a bad idea. While this may have worked great pre Penguin, it’s not something you can get away with now days. Seasoned digital marketers understand creating content that is designed to add value to the Internet is what drives results. If you’re stuck with a “search engines first” mentality, it will be reflect in your headlines. The best way to change a persons opinion or habits is through education. If you are new to the industry, we recommend spending some time looking at the past. There are thousands of blog posts that talk about the changes Google has been making over the last 10 years. When you understand the past, it will help you succeed in the future. Your blog should be the foundation for all dental marketing agencies. Content pulled from high quality posts can be used for eBooks & infographics. When you’re publishing great information on your blog, it will also drive all of your social media profiles. You will finally have something interesting to share with your community. We highly recommend installing Google Analytics, and paying particular attention to the engagement rate with your posts. If you see people aren’t clicking into the content, that’s a good sign your headlines need some attention. The other thing you’re going to want to measure is how many users are entering your website through the blog. Content marketing gives you the ability to create a website that ranks for hundreds of long-tail terms. The headline of your post will usually be what shows up in the Google listing. 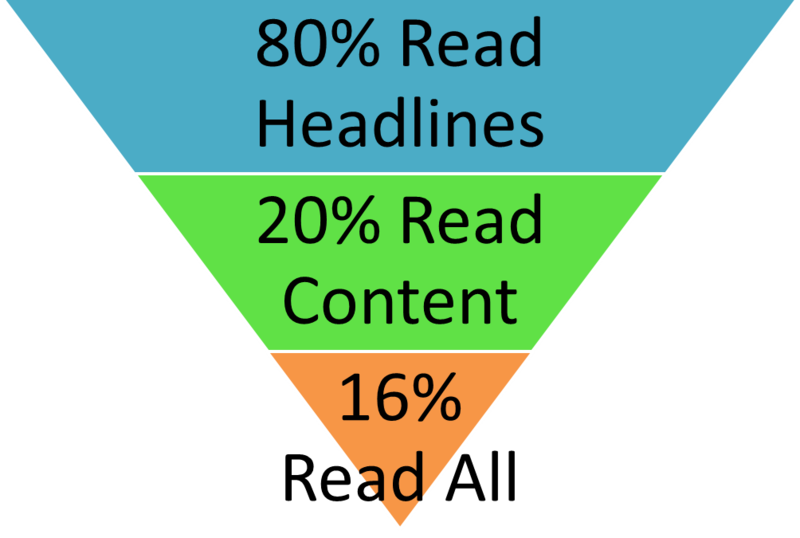 When you create great content with smart headlines, the posts will start driving mass traffic. Writing headlines that drive traffic is all about effort. You need to treat each post like it’s own little marketing campaign. Spend some time thinking what long-tail terms people might use when looking for something that relates to your post. When you spend the time & energy to really formulate each post, it will pay off with more traffic. When writing your headlines, there are a few best practices to follow. These guidelines will help you create blog posts that drive interest. Content & email marketing are two of the best tools for top tier digital marketers. It is impossible to use either tactic successfully without great head & subject lines. We strongly recommend taking the time to evaluate the open rate on your emails campaigns. It’s also important to have the right marketing mindset & measure the engagement rate with your blog. If you do these things, you should have the data needed to determine if you need to spend some extra time on this part of your work.